I really enjoyed reading Noah and Ryleigh’s story. 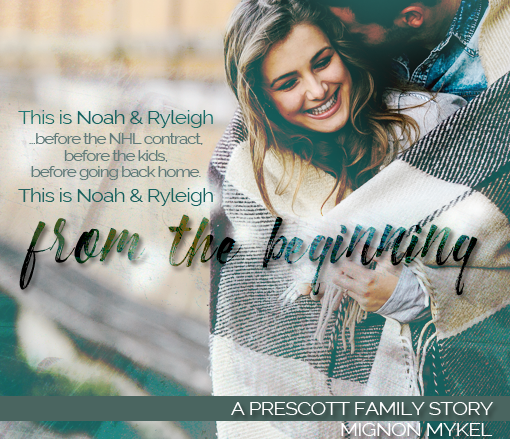 Their story is the beginning of “The Prescott” family series. I loved reading their trials and tribulations and of course the growth of their love for one another. This is definitely a slow-burn love story, so if your looking for a “wham-bam-thank-you-mam” kinda story then this book is not for you. Noah and Ryleigh are wonderful together, and the reader will be able to see why their children turned out the way they did when ‘you’ read their stories (I’ve already read Caleb’s story Interference). The reason I’m only giving this story a 3-star rating is because “I” had a hard time with the story being written in the present time. The author originally wrote this story in 2008 and went back and spruced it up and re-wrote it in the present. I think my problem is that I had read Interference first, and to read Caleb’s parents story written in the present time when “I know” they have a 24ish son.. well I had a hard time with that. In my mind Noah and Ryleigh were dating in 1992, and there were no cell phones, texting or watching games on the internet back then. I think the author brought it into the present to attract a younger crowd and used terminology they would understand (and I’m afraid I’m dating myself), but I really appreciate stories that are written in the proper era (ie: in 1992- DNA fingerprinting is invented and Bill Clinton was made President of the US). I know this is a fictional story and that nothing is ‘real’, but for me, the time-frame kinda has to make sense. I will continue on with this series because I really enjoy the author’s writing and story telling, and I can’t wait to read the rest of”The Prescott’s” stories.